House Bill 2214 would replace our current fair End of Course exams with the unfair High Failure Rate SBAC exams. House Bill 2214 is important because it will likely be presented for a vote in the House and Senate during the final days of the 2015 special session. House Bill 2214 would raise the graduation requirements in Washington state to the highest in the nation – greatly increasing the drop out rate and destroying the lives of thousands of low income young adults each year - and increasing our prison population – costing tax payers $100 million per year in added prison costs. In this report, we will explain why legislators and all concerned citizens in Washington state should oppose House Bill 2214. 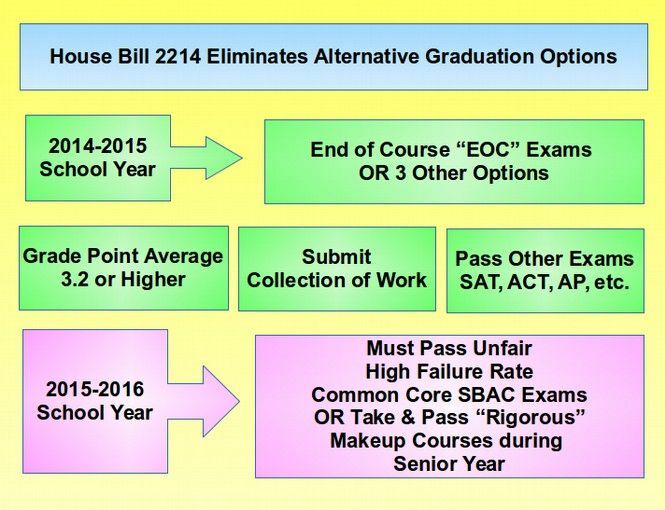 The real purpose of House Bill 2214 is to replace our current End of Course exams and all other current high school graduation “options” with the Common Core tests called SBAC. The problem with replacing our current state exams with the SBAC exams is that about 80% of all high school students can pass our current End of Course (EOC) exams but only 33% are able to pass the SBAC test! This information comes directly from OSPI and from the makers of the SBAC exams. Therefore, switching from our current exams to the SBAC exams is likely to dramatically lower the high school graduation rate in Washington state. Yet a recent poll taken in California, which also uses the high failure rate SBAC test found that 70% of all parents had no idea that the new Common Core tests had a much higher failure rate than the prior California State tests. It is likely that parents in Washington state also have no idea how abusive the new SBAC tests are – which is why we are writing this article to warn you! Should we put all of our eggs in the Common Core Basket? If you watch the hearing on House Bill 2214, you will see several carefully planned (planted) witnesses talking about what a great thing this bill will be and how great the Common Core standards and tests are going to be. It is almost as if the hearing was being held on Mars. None of the people in the room seem to be aware that in the prior year, both the Washington State Republican Party and the Washington State Democratic Party voted overwhelmingly to OPPOSE Common Core standards and the Common Core SBAC test. In just the past week, 100% of the students at Nathan Hale High School in Seattle opted out of taking the SBAC test. The same day that this hearing on House Bill 2214 was held, the legislature in the State of Tennessee voted unanimously to repeal Common Core and Common Core High Stakes High Failure rate testing. This makes Tennessee the 26th state in the nation to drop out of Common Core. 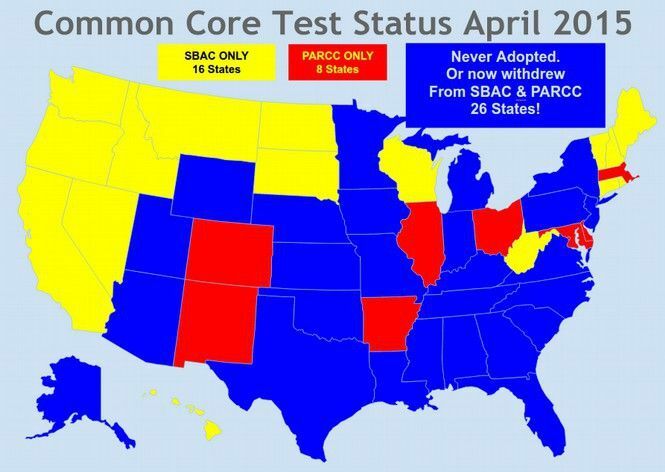 Why are so many states abandoning Common Core and Common Core tests? "I have seen nine and ten year old children vomit, urinate in class, break down and sob and shake uncontrollably, and have nosebleeds during these tests. I have heard children call themselves stupid, give up and hang their heads in shame because they can't make sense of questions which in some cases, don't make sense. None of these were students who had any previous history of these behaviors. I have seen teachers break down and cry at the end of testing because they are heartbroken watching their students, the children they love, devastated because it is impossible to finish tests. 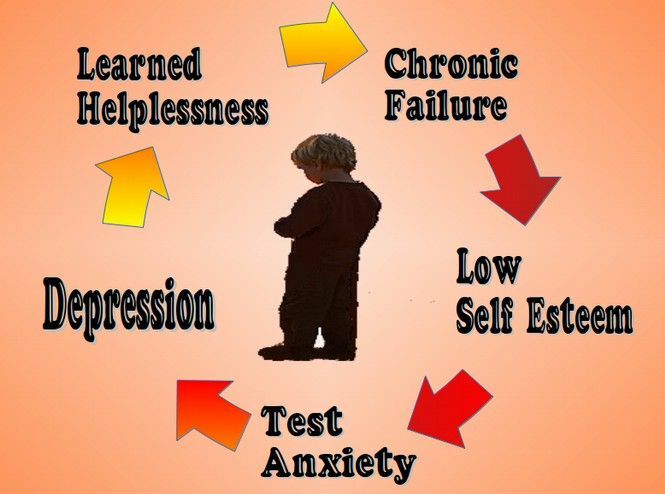 THIS is what happens to children when they are forced to sit for hours taking developmentally inappropriate, poorly written, high-stakes tests. Pro-test? 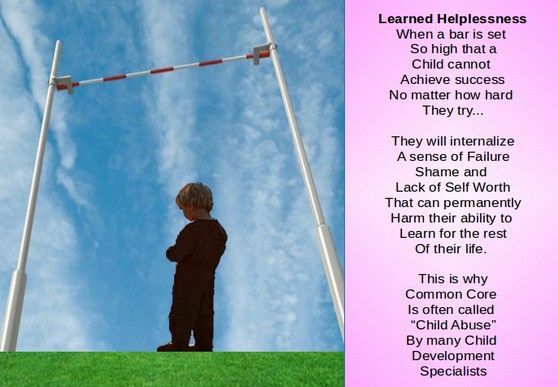 I defy ANYONE who is pro-testing to come witness what these children go through and say this child abuse is justified. This is why we protest!" Since House Bill 2214 is about changing the testing requirements from fair, well written tests to unfair poorly written tests, we will instead review how to tell a fair test from an unfair test and then analyze how many more students will be forced to drop out of school if House Bill 2214 passes. #1: A fair exam is directly related to the material taught in the course. For example, the end of course biology exam is directly related to material taught in the biology course. However, the SBAC Math and English tests often cover material that students have never been exposed to. Many of the questions on the SBAC test are not even related to Common Core standards! They are simply confusing questions designed to trick kids. 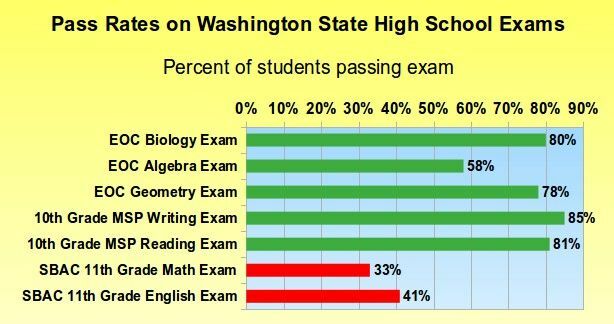 #2 A fair exam reflects the accomplishments of Washington state students as shown on national and international tests. #2: The level of difficulty of a fair exam is such that the majority of students who take the exam are able to pass the exam. Traditionally, over 80% of Washington state students passed the NAEP test. 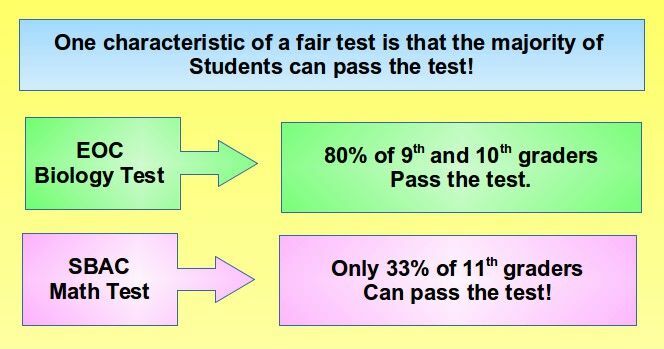 Therefore a fair state test is one in which over 80% of the students would be able to pass the test. For example, according to OSPI, in 2012, 80 percent of high school 9th and 10th graders passed the End Of Course (EOC) biology exam. 78 percent passed the EOC Geometry exam. 58% passed the EOC Algebra exam. 85% passed the 10th Grade Writing exam. 81% passed the 10th grade reading exam. However, according to the administrators of the SBAC test, only 33% will score Level 3 or Higher on the SBAC 11th Grade Math test and only 41% will score a Level 3 or Higher on the SBAC 11th Grade English test. 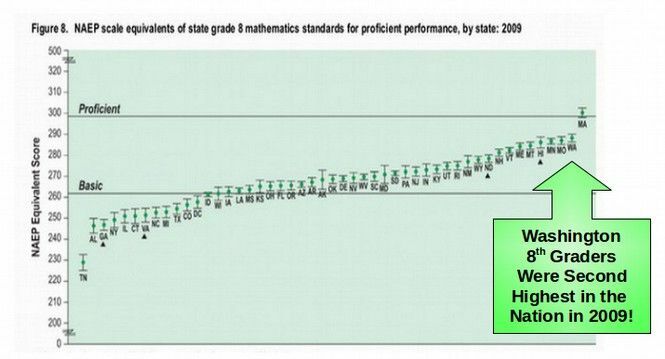 The majority of members of the state legislature could not pass the SBAC math or English exams. We know this is true because we have given the practice Common Core math test to several legislators and thus far NONE have been able to pass the Common Core math test! It is extremely hypocritical for state legislators to require high school students to pass exams that the majority of state legislators would be unable to pass. #3 The questions on a fair exam and the results of the exam are consistent for all students and statistically reliable and scientifically valid. The questions and results of the EOC exams are the same for all students and have been reviewed and found to be statistically reliable and scientifically valid. However, the questions on the SBAC exam vary from student to student with each student receiving a different exam based on their answers to prior questions. Such a process makes SBAC tests impossible to independently evaluate in terms of statistical reliability or scientific validity. #4 All students are able to take similar practice exams with an abundance of practice questions to help them better prepare for taking the real exam. With the End of Course Biology exam, there are about 50 practice questions from prior biology end of course exams that students can take to help them prepare for the real exam which has about 45 well designed and well evaluated questions given uniformly to all students. By contrast, the SBAC 11th grade math exam has only 10 practice questions (despite the test costing more than $200 million in tax payer funds – or $20 million per practice question). Then the real test has more than 40,000 possible test items that a student may or may not be given. There is no way for students to adequately prepare for the SBAC 11th grade math test. #5: All instructors and parents can see the questions in a fair exam after it is administered to insure that students were fairly tested. Parents and teachers have a constitutional right to see the test that their student was given to verify that the questions were fair. They were able to see test questions on all prior high stakes tests. However, since SBAC tests give different test questions to different students and since the test is copyrighted by a private trade group, neither parents or teachers can see the actual test questions that were given to their students. The current Washington State End of Course Biology exam goes through a rigorous evaluation process before a student is ever exposed to a test question. A committee of Washington state biology teachers prepares sample questions and answers. These are reviewed by OSPI and by another committee of Washington state biology teachers. Each word in each question is evaluated to make sure it is at least two grade levels below the level of students taking the test to insure that students are being tested on their knowledge of biology and not on their knowledge of English vocabulary. Potential questions are then subjected to pilot studies to gather data on the comparable difficult of the test questions. This data is sent to another independent committee of Washington state biology teachers. Only after this rigorous process are some of the questions selected for placement on a future year Biology EOC exam. Each year, there are 40 carefully chosen questions and at least 50 sample questions to prepare students. The process is fair, open, transparent. consistent reliable and valid. Each question on a fair exam evaluates a particular area a student was supposed to learn. Since all students take the same test with an EOC exam, it is possible for parents and teachers to understand exactly what questions and areas a student missed to help them improve on a retest. However, because the Common Core SBAC test varies from student to student and because of the tight security in protecting the copyright of the SBAC test questions, parents, teachers and students learn little more than a number printed on a sheet of paper. There is no way of helping a student approve after having failed an SBAC test. In fact, House Bill 2214 does not even bother trying to help students improve on the areas of the SBAC test that they missed. Instead, the proposal unfairly requires that the student take a course, such as a math course, that is “harder” than any previous math course a student has taken. So different students may be forced to take different courses during their senior year even though they got the same score on the SBAC math test during their junior year. The prime sponsor of House Bill 2214 is Representative Chris Reykdal, whose day job is at a state agency that has gotten millions of dollars from Bill Gates and the Gates Foundation. The bill was requested by Randy Dorn, who is now on the Board of a group that has gotten more than $60 million from Bill Gates. So in a way, both Representative Reykdal and Randy Dorn are getting their pay checks from Bill Gates. Sadly, Representative Reykdal is not telling the truth. Here is the truth about the Biology End of Course (EOC) Exam he is supposedly so worried about. The Biology EOC was first given in the spring of 2012. It has been given twice per year since then (in the winter and spring) with most 9th or 10th graders taking a year long biology course and then taking the Biology EOC exam in May. About 80% of these 9th and 10th graders pass the Biology EOC on their first try. Put another way, of the 76,000 students in the 10th grade cohort, about 61,000 passed the Biology EOC on their first try. Do you see any crisis in this chart? 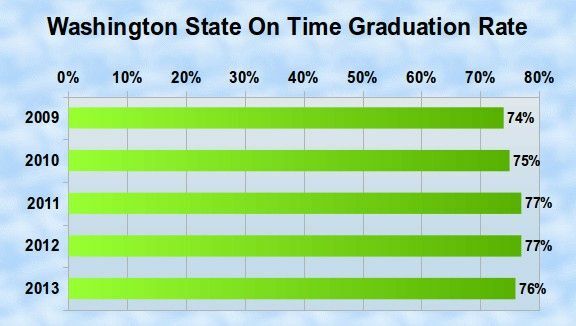 The on time graduation rate for Washington state has been about 75% for years now with another 5% graduating during an extended period of time for a total graduation rate of about 80%. There was no drop due to the Biology EOC exam. The solution to this problem of thousands of kids not graduating each year, if Representative Reykdal really cared about it, would be to pass a simple bill to allow students to graduate high school without passing the Biology EOC exam by getting a passing grade in a Biology or other science course (which was the requirement before the legislature passed the law in 2011 requiring passage of the Biology EOC exam). The issue here is that many students do well in a year long course but simply freeze up and forget what they know when taking a three hour 45 question Biology EOC exam. It is called Test Anxiety. A bill to waive this requirement would only be one page long. The other solution to the problem of thousands of kids not graduating every year would be for the House and Senate to pass a bill to restore $4 billion in state funding needed so we could lower class sizes back down to the national average so that kids who are struggling in school can get the help they need well before they even get to high school. But despite a 2012 Supreme Court order and a 2014 Supreme Court funding of Contempt of Court for ignoring the 2012 Order, Representative Reykdal and his friends in the state legislature have refused to fully fund public schools and instead have continued to give away billions in tax breaks to the wealthy every year – and even pass billions in new tax breaks for the rich! House Bill 2214 is not about allowing 20,000 additional high school seniors to pass this year. It is about making it much harder to graduate from high school by increasing high stakes high failure rate testing – not reducing it. The reason Bill Gates wants to increase the drop out rate is to convince parents that our public schools are failures so that the public will support his efforts to privatize and profitize our public schools by turning them into charter schools ran by Bill Gates and his friends. On page 7 and page 14 of House Bill 2214, the language permitting High School Grades, “Collection of Evidence,” SAT or ACT or AP or IB exam scores to be used instead of SBAC is eliminated. This would eliminate flexibility for students to show their academic ability in a variety of ways and require that all students jump over the SBAC bar. As noted above, the current graduation rate is about 75%. The current graduation requirements for the class of 2017 includes completing 20 credits including 3 credits of math. With 6 credits per year, 20 credits only leaves students with 4 elective credits where they can take courses they are interested in. This is one elective credit per year. The 20 Credit Requirement also allows students to fail or withdraw from one course per year and still graduate as long as they complete 3 high school math courses and numerous other required courses. However, the 2014 Legislature passed E2SSB 6552 that greatly increased the graduation requirements from the current 20 credits to 24-credits for the Class of 2019 and beyond. This means that students will not be permitted to fail a single course. In plain English, what this means to the typical high school student is that if they took and successfully passed Algebra One in 9th Grade, Geometry in 10th Grade and Algebra Two in the 11th Grade, but then failed the SBAC test either due to test anxiety or simply due to the fact that the SBAC math test is written with questions so confusing that it deliberately fails students, then this student will be required to pass a math course that is harder than any of their previous math courses during their senior year or they will not graduate. 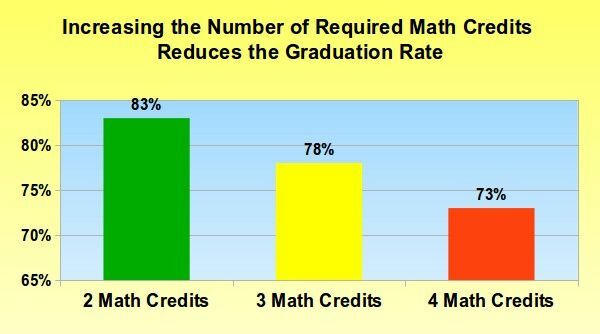 According to the National Center on Educational Statistics, there are no states that require four years of math AND 24 credits AND eliminate all alternate pathways to graduation. Therefore, if House Bill 2214 passes, Washington State would have the most demanding and rigid high school graduation requirements in the nation. Requiring more math courses has been conclusively shown to lower the graduation rate. For example, only 6 states require just two math credits to graduate. These states are Alaska, California, Maine, Montana, Pennsylvania, Wisconsin. The average graduation rate in these 6 states is 83%. 38 states require 3 math credits. The average graduation rate in these states is 78%. Only 6 states require four years of math to graduate from high school (and lack alternatives to this path). These states are Florida, Georgia, Rhode Island, South Carolina, Tennessee and West Virginia. The average graduation rate in these states is only 73%. However, the average number of total credits required in the 6 “high math requirement” states is only 21 credits. This means that students in these states can fail up to 3 courses and still graduate. Alternately, students can skip three courses allowing them more time to work on completing their four math courses. And should they still fail to complete the four math courses, there are several alternate pathways to graduation in these 6 states. House Bill 2214 combines 4 math credits PLUS 24 total credits PLUS eliminates alternative pathways to graduation. This leaves students in Washington state with no room to fail or skip even a single course and no alternate pathways to graduation. This means the graduation rate in Washington state is certain to fall from the current 76% to well below 70% and likely to below 66%. In short, House Bill 2214 would give us the highest graduation standards in the nation but also the lowest graduation rate. Washington state has an average grade cohort of about 80,000 students per year. With a graduation rate of 76%, we already have about 20,000 students per year who fail to graduate. The primary reason these students fail to graduate is that they grew up in poverty with an unstable home life and inadequate resources in their home because their parents lacked a good paying job. House Bill 2214 does nothing to address the lack of jobs for parents and therefore kids from low income families will continue to struggle with and drop out of school. However, House Bill 2214 makes a bad situation worse by placing unreasonable requirements even on kids who are not living in poverty. Lowering the graduation rate from 76% to 66% would mean another 8,000 students would fail to graduate. Many of these 8,000 students simply lack the math ability to pass advanced math courses. What are the odds of a student failing to pass the SBAC math test and a more rigorous 4th Year of Math during their Senior year? According to SBAC data released in September 2014, 67% a high school juniors will fail the SBAC 11th grade math test. The problem with forcing normal students to take as 4th year of higher level math is that students have varying innate math abilities. 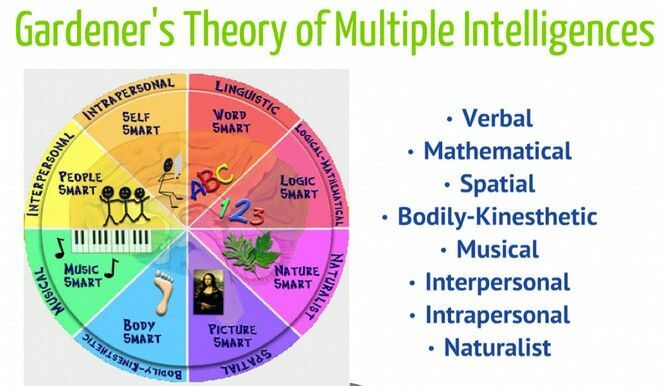 Dr. Howard Gardner calls this “multiple intelligences”. (See Howard Gardner, Frames of Mind, 1983). Although each human brain develops in a different unique way during childhood, multiple intelligences theory commonly groups intelligence specialization into 8 groups. These are folks who are good at verbal skills, math skills, graphic skills, physical skills (sports), musical skills, groups skills, understanding skills and/or nature skills. How humans develop “gifts” in different areas is a combination of genetics and environment. A child may have a natural gift for math and a parent who helps them with math so they develop the math part of their brain and will later do well on higher level math courses. But a different child may have a gift for words and may have a teacher who helps them develop their gift with words. Another child might have a gift for drawing and have a teacher who helps them develop their graphic art ability. Yet another child may have a natural ability to learn music and may have a music teacher who helps them develop this talent. But not every child is going to have a math brain any more than every child can be expected to learn to play a musical instrument. High level math requires an ability to think in very complex and abstract ways. Not all human brains are capable of learning complex higher level math because their brains have developed on some other specialized pathway. Nor do all humans need to learn complex higher level math to succeed in college or succeed in life. Forcing a graphic arts specialist to spend their Senior Year in a math course they are likely to fail is a crime. It is likely that many high school students would not be able to pass an advanced 4th year of high school math. This would increase the drop out rate from the current 25% to more than 35%. This would be a crime against our kids and a crime against our schools. 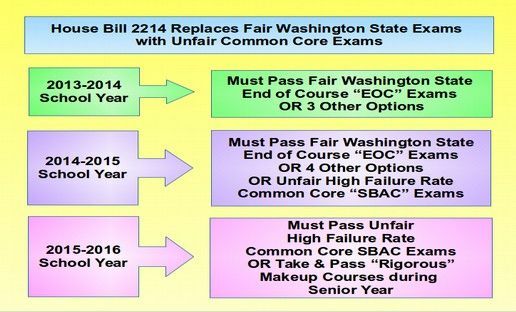 Because some legislators have expressed a concern about the SBAC test flunking two thirds of all Washington state students, a “loophole” was added to the end of House Bill 2214 allowing an unelected group called the State Board of Education to set graduation requirements pretty much any way they wanted. During a hearing in the House Appropriations committee on House Bill 2214 on April 21, 2015, a member of the State Board of Education reassured the committee that they intended to lower the cut score for passing the SBAC test all the way down to “Level One” to insure that more students pass the test. So while at the beginning of House Bill 2214, it states that a student must get Level 3 or 4 to pass the SBAC test, at the end of the bill, it allows the State Board of Education to change this standard to whatever it wants. This means that an unelected group of people will arbitrarily decide who passes and does not pass and who gets a high school diploma or does not get a high school diploma. It is hard to imagine a more unfair and undemocratic system than the one proposed by House Bill 2214. First, the legislature would eliminate all of the fair, reliable paths and tests to graduation and force students to take an unfair test that most of them are certain to fail. Then the legislature forces students to take a fourth year of advanced math in order to graduate. But then you also give an unelected group of people with almost no real educational qualifications the authority to randomly assign cut scores to allow failing students to pass and get a high school diploma anyway. The legislature first unfairly labels students as failures and then gives them a diploma anyway. The irony of this political double talk is that if the concern were simply increasing the number of students getting a diploma, this could be done simply by allowing the State Board of Education to reset the passing cut scores for the current Biology EOC exam. The real reason for House Bill 2214 is to create chaos and failure in our public schools in order to reduce public support for public schools and replace public schools with private for profit charter schools which are specifically exempted from the requirements of House Bill 2214. We conclude that House Bill 2214 will severely harm more than half of the one million students in our state. The harm will be most pronounced among the 80,000 students per year in our state who hope to get a high school diploma. It is possible that the changes proposed in House Bill 2214 will prevent more than 30,000 high school seniors per year from graduating. Some may question the harshness of the conclusions in this report. How can a bill with 44 sponsors in the House of Representatives be this bad for our kids? Why would Randy Dorn ask for such a harmful bill and why would Representative Reykdal agree to be the prime sponsor of such a bad bill? To answer this question, we need to “follow the money.” There are billions of dollars to be made each year from privatizing our public schools. Some of our kids have already been subjected to the harm of Common Core tests. We will next look at what has already happened to these students. For the past decade, an average of about 20,000 students per year failed to get their high school diploma. Of these 20,000 students per year, about 13,300 mostly low income young adults per year earned their GED certificate rather than their high school diploma in Washington State. However, in January 2014 Pearson, a multinational corporation, took over the GED test and made the GED so difficult to pass that it was no longer related to the academic skills and abilities of the average high school senior. In fact, Pearson made the GED so hard to pass that most college students could not pass it! Pearson made it as difficult to pass as the SBAC tests. As a consequence, the number of candidates (high school dropouts) who passed the new Pearson GED test in 2014 in Washington State fell to only 2,850 – a decline of more than 10,000 students from the previous average. These are not hypothetical future children. These are low income young adults who have already been harmed by “raising the bar” and high failure rate Common Core testing. There is a fairer high school equivalency test called the Iowa HiSET test. We therefore submitted a bill called House Bill 1743 which would end the Pearson GED test monopoly and allow students to take the fairer HiSET test instead. The bill was introduced in February 2015 but then killed by the same political leaders in the House of Representatives who are now promoting House Bill 2214. There is an important reason why Bill Gates and other Common Core promoters do not want a fair GED test. It is because once students understood how unfair the Common Core SBAC tests were, they would likely want to drop out of high school in greater numbers to get their GED certificate instead. It therefore was necessary for the Ed Reformers like Bill Gates and his friends in the Washington State Legislature to close the GED escape hatch. The ed reformers are going to be making school a much more frustrating place to be because they want it to be frustrating. They want us to hate public schools, scrap public education and give all of the power to educate to corporate reformers- to turn all of our public schools into for-profit charter schools or to continue with lowly funded, highly crowded public schools made so miserable that no one wishes to attend, yet massive amounts of money must go to the common core overlay. The corporations win either way! How much will the decision by the leaders of the Washington State House of Representatives to stay with the Pearson monopoly cost Washington State tax payers? 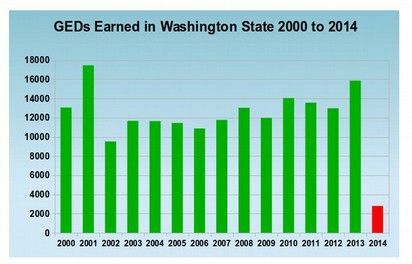 Ten thousand fewer high school drop outs will get a GED certificate each year due to the fact that leaders of the Washington State House of Representatives were more concerned about protecting Common Core than protecting the rights of low income young adults to a fair high school equivalency test. But this problem will get much worse as the number of high school dropouts will skyrocket if House Bill 2214 passes. Instead of 10,000 fewer kids getting their GED certificate every year, there may be 20,000 low income young adults failing to get their GED. High school dropouts who do not get a GED are as much as three times more likely to commit a crime as those who do have a high school diploma or GED. Here is a quote from a recent study: “Nearly 1 of every 10 young high school dropouts was institutionalized versus fewer than 1 of 33 young high school graduates.” “The Consequences of Dropping Out of School, Joblessness and Jailing for High School Dropouts and the High Cost for Tax Payers” October 2009 - Therefore having 20,000 fewer GED graduates may add as many as 2,000 additional prisoners per year to our state prison system. At a cost of $50,000 per year per prisoner, the cost to tax payers will be an additional $100 million per year. How to we stop this crime against our kids? Since the United States Senate has just agreed on a reauthorization of federal education funding requirements that restores the ability of each state to choose their own tests and standards without punishment from the US Department of Education, and since many states have already withdrawn from unfair, unreliable and abusive Common Core tests, we urge the Washington State legislature to reject House Bill 2214 and instead restore the prior MSP and EOC exams until such time as a majority of the members of the Washington State legislature are able to pass the SBAC tests. One the following pages, we describe in line by line detail the drawbacks of House Bill 2214. Feel free to email me if you have any questions. Together, we can and will stop this insane bill. Page 2, Line 1 through 8: There is no evidence that the SBAC tests or “more academically rigorous policies” will improve the performance of Washington state students in post secondary education or in gainful employment. Instead, it is more likely that increasing reliance on high stress high failure rate tests will REDUCE the performance of Washington state students. There is also no evidence that the smarter balanced assessments (SBAC) will accurately or reliably evaluate students on their career and college readiness. Numerous studies have shown that grades from teachers are a much more accurate predictor of college readiness than any single set of high stakes tests. Page 2, Line 31-32: There is no evidence that SBAC tests are an accurate or reliable measure of school or school district accountability. Instead, SBAC tests are directly related to the income level of the parents of the students in a school district. Using SBAC tests to evaluate either schools or school districts therefore unfairly punishes schools and school districts with a higher percentage of low income students. Page 2, Line 37 - 39: The SBAC Math and English 11th Grade tests are at least twice as expensive and twice as time consuming as the prior MSP and EOC exams. If the legislature was truly concerned about saving money and instructional time, then they would eliminate the SBAC tests rather than eliminating the MSP and EOC tests. Page 3, Line 1-2: While the current MSP and EOC tests “do not result in students meeting a college or career ready measure” neither do the SBAC Math and or English exams. The claim that Common Core and/or SBAC tests make students “career and college ready” is purely a marketing slogan. There is no evidence that either will do anything to help students better prepare for college or careers. In fact, by diverting funds away from lowering class size and into focusing on test prep trivia, Common Core and SBAC are likely to REDUCE our students abilities to be career and college ready. Page 3, Line 5: There is no evidence to support the claim that “locally directed remediation and intervention strategies including retaking courses in the twelfth grade” would better prepare students students to be career and college ready. Student performance is not improved through isolated courses. Instead, the only proven method of increasing student performance is by lowering class sizes throughout a students K12 education so that struggling students can get the help they need when they first begin to struggle. The problem with waiting until the 12th grade to help students is that the student's negative attitude towards school and their ability to learn (which is strongly related to later performance) becomes firmly entrenched between the 6th and 9th grade. Remedial programs are much more likely to succeed if they begin in the 5th Grade rather than in the 12th grade. Page 3, Line 14-22: There is no evidence that students or tax payers will save any money by imposing the SBAC tests on students in the 11th Grade. In fact, after several years of Common Core tests in other states, (including New York State and Kentucky) there was NO SIGNIFICANT CHANGE in student test scores or academic achievement as a result of imposing Common Core standards or Common Core tests. In fact, compared to Washington state students, the scores of New York state students FELL as a result of the extreme pressure and anxiety and disruption created by Common Core standards and Common Core tests. Therefore changing from the MSP and EOC tests to the SBAC tests is likely to increase the need for college remedial courses and increase the cost to tax payers and students. Page 3, Line 35-37: The three Common Core tests should not replace our current EOC and MSP tests until such time as they have been proven scientifically in objective controlled independent studies to be reliable and valid measures of the actual abilities of Washington state students. Page 4, Line 3 -12: The words “but need not be limited to” should NOT be struck as school districts should be given the ability to determine their own graduation requirements to meet the specific and unique needs of students in their own school district. Alternative assessment measures are extremely important to allow students with unique talents and abilities to have those talents and abilities recognized. Page 4 and Page 5: None of the language in the current law should be eliminated. Level 4: Advanced or Well Above Grade Level. (what historically has been an A). Changing Washington state law to require that all students get a B or higher on a high stakes exam (Level 3 or higher) in order to graduate would be the biggest change in the history of Washington state educational policy. This would be extremely unwise as it would result in more than half of the students in Washington state taking 12th grade remedial courses and likely more than half of all high school seniors not graduating from high school! Page 5, Line 24-27: Merely offering students a chance to retake unfair and unreliable SBAC tests will not greatly increase the percentage of students passing the unfair and unreliable SBAC tests. What are needed are fair and reliable tests that the majority of students have a reasonable chance of passing the first time they take the tests (such as our current Biology and other End Of Course exams)! Page 6, Line 7 - 11: It is inappropriate to punish students in public schools by subjecting them to unfair and unreliable tests while exempting home school students and private school students from unfair and unreliable tests. All students from all schools deserve fair and reliable tests and the right to be evaluated using the same set of standards. Page 6, Line 14 to 40: The prior MSP and EOC exams should not be replaced with the unfair and unreliable SBAC tests. Page 7, Lines 3 through 40: Objective alternative assessments should not be eliminated. Page 8, Lines 1 through 40: Objective alternative assessments should not be eliminated. Page 9, Lines 1 through 31: Objective alternative assessments should not be eliminated. Page 10, Line 11 through 36: Requiring 8th Grade students to establish a “high school and beyond plan” is not in keeping with the research on child development and brain development. Many 8th graders are still in the “concrete operational” stage of human and brain development. They are simply not capable of thinking in the abstract terms required to develop an accurate high school and beyond plan. They would be far better off focusing on their current 8th grade course work. A far better plan would be to allow 8th graders and 9th graders more independence in pursuing their interests to maintain a positive attitude about school and then when their brains are better developed, have them develop a “college and career” ready plan and resume in the 10th grade for their final two years of high school. Page 11, Line 3 - 5: Level 3 or 4 is the same as requiring a B or better on a high stakes exam to pass the test. This is a dramatic change from past graduation requirements when only Level 2 or higher (at grade level) was required to graduate without taking remedial courses. The language should either be changed to level 2 (at grade level) or eliminated entirely since the SBAC tests are unfair and unreliable. Page 11, Line 21 to 31: Defining “high school transition course” as meaning “college placement” course would be a radical and unwise change from our prior Washington state graduation requirements. It is neither wise not necessary for ALL graduating high school seniors to pass college placement courses. Not all high school seniors will go on to college. Making them pass college placement courses will simply reduce the percentage of students who graduate from high school in Washington state and unfairly label students as “failures” who in the past would have gotten their high school diploma. This language should therefore be eliminated. Page 12, Lines 1 through 40: It is contrary to the Washington State Constitution and contrary to basic democracy for the state legislature to transfer the responsibility for setting high school graduation requirements from the elected Superintendent of Public Instruction to the unelected and unaccountable State Board of Education. This entire page should be eliminated. Page 14, Lines 1 through 40: It is contrary to the Washington State Constitution and contrary to basic democracy for the state legislature to transfer the responsibility for setting high school graduation requirements from the elected Superintendent of Public Instruction to the unelected and unaccountable State Board of Education. This entire page should be eliminated. Page 15, Lines 1 through 40: It is contrary to the Washington State Constitution and contrary to basic democracy for the state legislature to transfer the responsibility for setting high school graduation requirements from the elected Superintendent of Public Instruction to the unelected and unaccountable State Board of Education. This entire page should be eliminated. Page 16, Lines 1 through 40: It is contrary to the Washington State Constitution and contrary to basic democracy for the state legislature to transfer the responsibility for setting high school graduation requirements from the elected Superintendent of Public Instruction to the unelected and unaccountable State Board of Education. This entire page should be eliminated. Page 17, Lines 1 through 40: It is contrary to the Washington State Constitution and contrary to basic democracy for the state legislature to transfer the responsibility for setting high school graduation requirements from the elected Superintendent of Public Instruction to the unelected and unaccountable State Board of Education. This section should be eliminated. Page 17, Lines 21 through 34: The EOC and MSP courses should be continued until such time as the SBAC tests have been shown to be reliable and valid and until such time as the majority of state legislators have been able to demonstrate that they are able to pass these SBAC tests. Page 17: The alternative assessment options should remain in place until such time as the SBAC tests have been shown to be reliable and valid and until such time as the majority of state legislators have been able to demonstrate that they are able to pass these SBAC tests. Page 18: It is unwise to require the Superintendent to transition from an MPS and EOC assessment system that is known to be fair, reliable and valid and towards an SBAC system that is known to be unfair, unreliable and invalid. Page 19, Line 26 to 29: Merely earning a Level 3 or 4 on a single unreliable SBAC test does not in any way insure that a student is “career or college ready.” In fact, the term “career and college ready” is simply a meaningless marketing slogan. This language should therefore be eliminated. Page 20, line 22 - 27: It is not appropriate for the Superintendent of Public Instruction to waste public funds on a marketing campaign when our state suffers from the most overcrowded schools in the nation. This money better serve students by being spent to hire more teachers and reduce class sizes. Students do not need a marketing campaign. They need lower class sizes and more teachers. This entire section should therefore be eliminated. Page 21, Line 20-28: Alternative assessment options should not be repealed. This entire bill is extremely unwise, not supported by any credible research on child development and human learning. It therefore should be opposed.